I subscribe to a small number of retail email lists that notify me of "special deals" on items that are of general interest to me...primarily electronics and some sporting goods. I rarely end up ordering anything via those e-flyers, but the one exception is Best Buy's "Deal of the Day" email. I've gotten some really good savings on things like memory cards and flash drives; these items pop up on the email frequently. And now I have another product that I'll be watching for: light bulbs. The primary lighting source in our home is 65-watt equivalent indoor flood lamps in recessed ceiling fixtures (aka canned lights). I've never counted them but I'm guessing we have about thirty, and that adds up to a pretty significant investment in light bulbs. 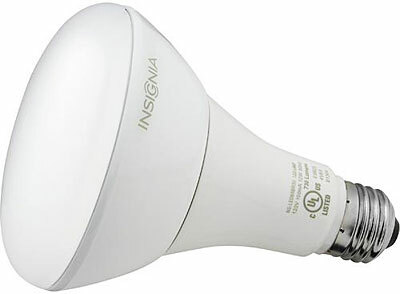 Our current bulb of choice is that evil incandescent model that haunts Al Gore's nightmares. I've never been enamored with CFL bulbs. I gave the swirlies a whirl in our previous house and didn't see any greater life in those bulbs as compared to incandescents, and found the non-instant-on feature quite annoying. I'm all in favor of saving energy, but just can't see the devil in incandescent bulbs that everyone claims is lurking there. I would, however, be quite open to trying an LED bulb, even though the strings of LED Christmas lights we used in the past were ridiculously wimpy. So, when Best Buy advertised these LED indoor floods for half price, I was intrigued. I put an order in for three of them, and have been using a couple in our home office for about a week. I'm very happy with the result. Even though the bulbs are slightly smaller than the ones they replaced, they're actually brighter, and they put out almost no heat, which will be a blessing when (if?) we get into serious summer. I have no idea if their lifespan will come close to the ridiculous-sounding claim on the box, but even if it's only half as good, it will still be better than the incandescents. At a couple of sawbucks per bulb, I'm not anxious to undertake a wide scale replacement of all our bulbs, but at half that price, it begins to make more sense. So, I'm going to keep an eye out for future deals in the daily email, and see if the bulbs will actually make a noticeable dent in our electric bills. Last year, we had our entire house re-wired. Initially, I hired an electrician to replace two tube florescent fixtures in our kitchen which had conked out due to age... the house is old and these fixtures had been in use for well over 20 years. When they delved into the ancient wiring and cobbled up mess of previous "fixes" in our attic, it didn't take me long to realize we needed to update all the wiring. Since I was tired of using the adapters for 3-pronged cords anyway, one look at the rotting cloth covering the wire that had been chewed on by several generations of squirrels (I hope they were squirrels, because rats with teeth that big frighten me) and I said "OK, rewire this house." And since I hated the ceiling fixtures in almost every room, I decided this was a good time to replace them. I chose LED fixtures for six rooms and so far (13 months) I am thrilled. The two fixtures in the kitchen are still florescent, but with smaller tubes that give off just as much light. The bathroom fixtures can accept either kind of bulb as can our lamps. Since we had already replaced the ancient AC with an energy efficient one and replaced all the windows with these double-paned permanent storm window thingies, our electric bill was already low, so I can't tell if the LED bulbs are all that energy efficient. What I do know is that I haven't replaced a burned out bulb in 13 months and I'm not careful about lighting up the place day and night. One LED bulb in one lamp has burned almost continuously since the new wiring. It's our night light and it's in a room that needs extra light during the daytime. The only time it's not been on is when the power is out to the entire house during a storm. We would have changed an incandescent bulb at least 3 times. I am (in case you hadn't guessed) a big fan of LED lighting. This page contains a single entry by Eric published on April 3, 2014 10:03 PM. We interrupt this hiatus for some important scavenger footage was the previous entry in this blog. Rites (and blights) of spring is the next entry in this blog.